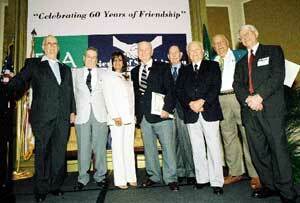 "60 Years Ago Today Our Grandfathers Made History"
MIAMI, February 14, 2005—Today marks the 60th anniversary of the historic meeting between then-President Franklin Delano Roosevelt and King Abdulaziz that marked the official beginning of diplomatic relations between the United States and Saudi Arabia. To recognize the anniversary of this historic meeting on board the USS Quincy in Egypt’s Great Bitter Lake in the Suez Canal in 1945, the grandsons of both former leaders gathered today at an inaugural celebration held in Miami, Florida. Hall Delano Roosevelt and H.R.H. Prince Abdulaziz Bin Abdullah Bin Abdulaziz Al-Saud were guests of honor at the inaugural event, which was hosted by the Friends of Saudi Arabia, an organization aimed at strengthening the foundation of goodwill and mutual understanding between Saudis and their international partners. The focus of the event, which was a rededication of the spirit of the goodwill between the United States and Saudi Arabia, with an emphasis on the development of personal contact between Americans and Saudis including promoting and expanding small and midsize business contacts. In addition to the keynote addresses, the guests viewed a documentary archive film of the original meeting and an acknowledgment of veterans who served on the USS Quincy and the USS Murphy, which transported King Abdulaziz to Great Bitter Lake. The event took place at The Ritz Carlton Hotel in Miami’s Coconut Grove. Guests included politicians, representatives of Florida’s universities and heads of charitable foundations, as well as U.S., Saudi and Hispanic community and business leaders. 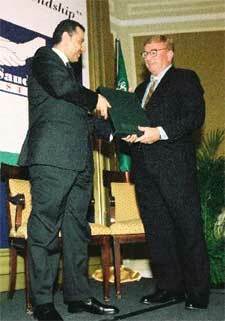 Friends of Saudi Arabia (FSA) was launched on January 1, 2005, to establish goodwill between Saudis and their international partners. FSA pursues this objective by organizing and participating in events that offer opportunities for personal interaction, social dialogue and friendship on projects of mutual interest. The vision of this organization is to build a strong foundation of goodwill and mutual understanding on the cultural and socio-economic planes between Saudis and their international partners. Its mission is to promote multi-level cultural and socio-economic programs designed to enhance awareness of Saudi society and develop positive relationships on a personal and professional level between Saudis and their international partners. Visit Americans for Middle East Understanding for additional information.